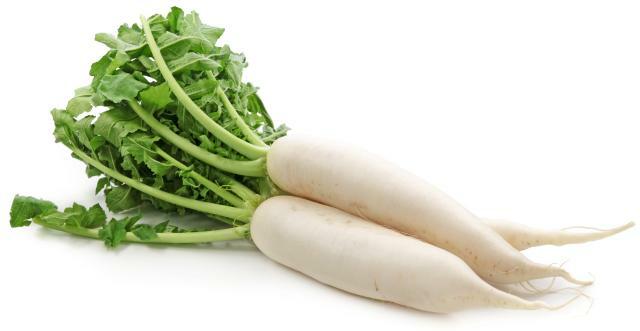 Daikon White Radish used in Ayurveda to cure Kidney Stones, Piles, Indigestion, Jaundice, Sore Throat, intestinal & oral cancers, Side Effects & Precautions. White Radish belongs to the family of root vegetables. It tastes acrid, sour, and pungent and has peppery flavor. Radish is available in four varieties Red, White, Black and yellow. It was cultivated in Europe initially. Also widely cultivated in Asia. Fresh Radish juice of 50 to 100 grams mixed with little sugar and taken early in the morning will give relief from kidney pains in 3 to 4 days. If taken for 3 to 4 weeks it gradually dissolves stones in kidneys and urinary tract. Take equal quantities of radish, Indian Liquorice seed, and it’s root and grind into paste with water. Add black sesame oil equal in weight to half of the above mix heat till only oil remains. Filter the oil residue and apply the oil on bald scalp. It results in gradual growth of lost hair. Every evening, consume freshly cut slices of Daikon White Radish with sugar sprinkled on it. This helps to slow down the rate of premature greying and keeps the hair shining. Slice baby Radish into 4 pieces. Sprinkle little salt and put the slices in deep fridge. Eating one baby Radish before meals will improve hunger and digestion. Mix 50 grams of the juice of raw Radish leaves and mix with 20 grams of powdered candy sugar. Consuming this mix twice a day will give faster cure from jaundice and also gives energy to body. Eating raw Radish gives relief from constipation, irregular bowel movements, Diarrhea. It helps digestion by producing bile enzyme. As part of diet the Radish improves immunity, removes mucous from throat and fights cold and cough. Eating Radish keeps skin young and radiant. Applying crushed Radish on skin cleans it. Eating Radish does not impact blood sugar levels also controls absorption of sugar into bloodstream which is good for diabetics. Radish should not be taken along with fish or black gram. Milk should not be taken soon after taking radish. Note: The above content is for information sake only. Contact medical professional before using it as medicine.